We were staying in a small coastal town of Karwar in Karnataka, about seven kilometres from south of Goa. My two-year-old daughter was not able to acclimatise. I was giving her anti-allergics and antibiotics, but she kept catching cold. One day, my friend in Karwar, Megha Gaonkar, told me about the medicinal powers of a plant called saveer sambar soppu in Kannada. It means a thousand utility leaf. The leaves smelled like ajwain or carom seeds. But Gaonkar said it was some other plant. “Boil 10 to 12 leaves in about a glass of water till one third the amount is left. The decoction will act as a great cold and cough reliever,” she told me. It worked. My daughter recovered within five days. After spending one-and-a-half years in Karwar, we shifted to Chennai. Recently, I saw saveer sambar soppu growing in a neighbour’s garden. It is omavalli, the Tamil name for ajwain leaf, the neighbour told me. V Pad-mavathi repeated the same utilities of the plant as Gaonkar had explained. She also mentioned that chewing freshly plucked leaves of the plant or their juice can relieve flatulence. I decided to do some research on the plant. Padmavathi guided me to a nearby horticulture centre. Nobody at the centre confirmed its scientific name; all they said was it is not an ajwain plant. I, however, picked up a pot of the plant for the balcony of my home. Search on the Internet gave me results of a plant that looked similar to omavalli, with slight difference in the shape of leaves, called Indian Borage (a species of Plectranthus). Omavalli and Plectranthus are sometimes used as synonyms. Botanist friends told me that omavalli is a species of Coleus, patharchur in Hindi. Some Coleus varieties are used as ornamental plants. They require less water and care. The leaves are broad and succulent, with a layer of velvety fine hair. Unlike other herbs, the plant is hardly sold in markets. People who are aware of its benefits, like treating nausea, grow it in their gardens. Padmavathi also told me that Coleus makes delicious snacks, like pakodas (fitters) and a tasty dip to go along with them. 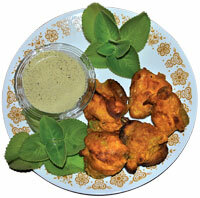 Make a thick batter of besan by adding the above ingredients, except leaves. Heat oil in a saucepan. Dip each leaf in the batter and release it slowly in the oil to deep fry. Serve hot with dip. Heat oil in a saucepan. Crackle jeera and pepper corns in it. Add chopped leaves and sauté till the mixture leaves water. Let it cool. Grind the mixture with yoghurt. Add salt and sugar. Good presentation by Sudeshna, but how to spread such information to wider India. I also thought that both plants are same and tried to grow it from the ajwain seeds present in my kitchen and got a different looking plant. Now I know why it happend to me.